Hello everyone. I apologize in the long delay for my Diablo 3 review. I know the game has been out for a few months now, but I was hoping to progress through Inferno before posting anything, however, thanks to my wonderful job and me being in South Korea at the moment, I’ve found myself a little short on time.Anyway, without further delay… I present you with Diablo 3: A Long Overdue Review. Diablo 3 Coming February 1st!? The rumours about the Diablo III release date were quashed by Blizzard’s Community Manager via Twitter, @Bashiok, he said: “Diablo III does not have a release date. Any store or person claiming otherwise is guessing,” added by Akardo. 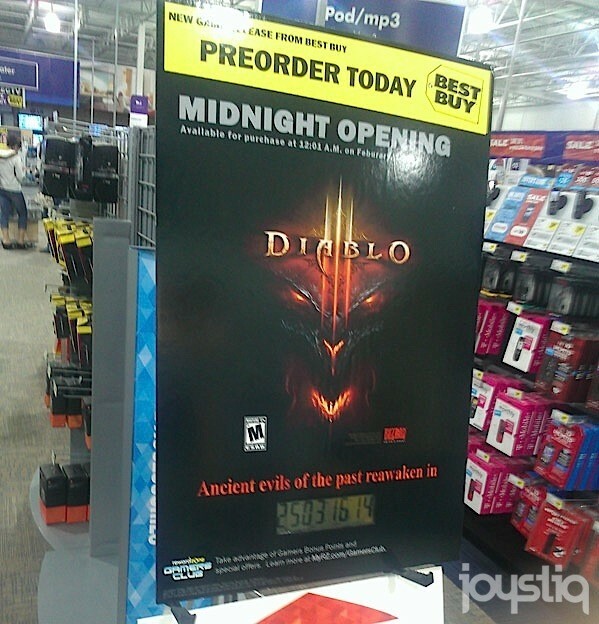 For all of you who have been waiting for the ages it looks like Diablo 3 finally has an official release date! Well….Best Buy official that is. It seems that in Rochester, Minnesota a countdown display for the game was spotted inside of a Best Buy store. Blizzard has not commented on this yet but it looks like Best Buy’s website reads the same date. For proof the picture is below, it has been checked and it is legitimate. IGN and Joystiq are looking for comments from Blizzard soon. BlizzCon 2011 started today with CEO and Founder, Michael Morhaime, making some big announcements, followed by a crowd favourite, Chris Metzen. Biggest announcements for each of Blizzard’s big franchises include the new World of Warcraft expansion, Mists of Pandaria, which was leaked several months ago but has now been made official. With the new expansion, there will be new PvE zones and general content, along with the new race (of Pandas) which can be played by both Alliance AND Horde, the new class, Monk, and the level cap goes up to 90. There will also be a new talent system, and more PvE content that will convince you to play more out in the world, rather than sitting around cities. Diablo III is now “on the home stretch,” said Metzen, with still no official release date, due to Blizzard’s usual process of it being released “when it’s done.” Diablo 3 Collector’s Edition includes in-game items for D3, SC2, and WoW, as well as an art book, and a very awesome 4GB Soulstone USB device. As of now, you can purchase a World of Warcraft Annual pass – a year’s subscription that you pay for monthly, but you get some excellent goodies, including a digital version of Diablo 3 for free, access to the new WoW expansion beta, and an in-game mount: Tyrael’s Charger. With Starcraft 2, there has been various units released for Terran, Protoss, and Zerg, but the focus this year is on the expansion, Heart of the Swarm, which continues the epic storyline with Kerrigan in the campaign, as well as new multiplayer modes that are yet to be seen. You can still purchase a BlizzCon 2011 Virtual Ticket to see the upcoming panels, competitions, and tournaments, and still get the Murkablo WoW in-game pet and see Foo Fighters live tomorrow night. Blizzard have also released three EPIC trailers for each game that can be found online now, including the especially epic Diablo 3 trailer, The Black Soulstone. We have come up with a list of our top ten most anticipated games of 2011. Over the next two days you will find out about why we think these games will rock 2011 and with a wide range of games in our list we hope you enjoy reading it as much as we enjoyed writing it. Batman: Arkham Asylum, in my opinion, re-wrote the Batman franchise for the new generation of gamers. Being the first real successful Batman game, it was recieved with open arms by critics from all round, being named ‘Best Superhero game’ by many (including IGN). Batman is my hero, I’ve been a fan of the franchise for as long as I can remember, and I was really impressed by Arkham Asylum because of how it incorporated so much history and references, and I’m sure Arkham City will be no different, with it including the likes of Catwoman and the nefarious and underrated Hugo Strange. Titan – Blizzard’s new MMO? At the end of November some leaked documents appeared online via MMOGameSite which seemingly detailed Blizzard’s release schedule up to 2015. In this document there are the details of WOW, Starcraft and Diablo 3 expansions but interestingly there was also a release date for an unknown title called ‘Titan’ for Q4, 2013. There were rumours circulating that this could be Blizzard’s next gen MMO which was first hinted at a couple of years ago. Interestingly at Blizzcon this year Blizzard announced that other than WOW Blizzard were not currently developing another MMO and had no plans to. The media is not supposed to know anything about that. It’s our next-gen MMO project.